In the last 30 years, human understanding of fungi, and their role in farm and garden ecosystems, has grown dramatically. As a result, there are a wealth of new products on the market that help home gardeners and farmers alike in improving soil fertility while diversifying their harvest. I love mushrooms on my dinner plate, but even more so, I love what various fungi, both the edible and the nearly invisible, can do for small farms and homesteaders. The two major applications of fungi for the vegetable grower are called soil mycorrhizae [mahy-kuh-rahy-zee], and myco-gardening. Soil mycorrhizae consist of vast networks of underground fungi that help our plants absorb diffuse nutrients while improving overall soil quality. Myco-gardening goes a step further, and utilizes edible and gourmet mushroom species as symbiotic, or companion plantings among various vegetable species. The modern veggie grower has a number of commercial options to support the growth of these helpful fungi, as well as some low-tech, cost-saving, management practices that can improve your results. Before you dive into either mycorrhizae, myco-gardening, or both, take a little time to learn more about these exciting new tools in your gardening “tool box”. In the inches below our garden beds and vegetable fields lies a vast network of of fungi—mobilizing nutrients, and improving soil conditions. The name for these fungi are mycorrhizae, literally meaning “fungus root”. Acting much like an extension of your vegetable plants’ roots, these extensive mycorrhizal networks serve as a critical link in allowing your garden to tap the full potential of your soil. While some mycorrhizal species will produce non-toxic—but inedible—mushrooms, most will simply remain as a beautiful, nearly invisible, white network of sub-soil mycelium. Author, and founder of Fungi Perfecti (see sources), Paul Stamets, has spoken and written about the role of mycorrhizal fungi in vegetable and flower gardens extensively. Stamets has even conducted his own formal, and informal, research studies photo-documenting very impressive yield and quality differences among veggies and flowers grown with his mycorrhizal fungi inoculants. These studies do underscore the critical role that soil mycorrhizae play in plant productivity, but further analysis also reveals some important and practical lessons for home gardeners to consider. Many gardeners simply want to know, “Do I need them?”. The short answer is “yes”, followed with a “but maybe…”. Yes, you do need—r at minimum, want—to have a rich network of soil mycohrizae. Besides the increase in nutrient accessibility, your plants will also benefit from increased disease resistance and improved vigor. Now, you can go out and purchase packets of mycorrhizal spores to spread into your garden beds, but maybe… maybe you already have them in your soil! In the controlled, small-scale experiments performed as testimonials for Fungi Perfecti’s Myco-Grow mycorrhizal products, photos sometimes display two- to three-fold crop-yield increases compared with the uninoculated control. But what is important for gardeners to remember when looking at these and similar photos, is that these trials are most often conducted using pasteurizedsoils. That is, a steam injection into the soil prior to planting eliminates all existing micro-flora, including potentially existing mycorrhizae, within the bed. This is not intended to mislead, and is simply a valid scientific control, but it points to an important lesson in when mycorrhizal products should and shouldn’t be used. If properly managed, a healthy vegetable garden, rich in organic matter, balanced in pH, and bio-diverse in planting, will naturally develop a luxuriously micro-thin web of white, utilizing the native fungal spores already present in your fields. Author Jeff Gillman writes critically on the subject in his book, The Truth about Garden Remedies: What Works, What Doesn’t and Why. Gillman believes that the basic principles of organic soil management will lead to abundant natural populations of the requisite beneficial fungi within your food plot. He also suggests that it is questionable whether the “non-native” mycorrhizae supplied by companies will survive for any extended period of time. Where experts do seem to agree is the helpful role of these fungi in the greenhouse. Just as the impressive results from the Stamets trials were achieved in steam-sterilized soils, our greenhouses are often filled with soil-less seedling mixes—or relatively sterile compost blends. Here it seems that an infusion of purchased mycorrhizae products provides unquestioned benefit. Seedlings inoculated with mycorrhizae will benefit from the same nutrient absorption as garden plants, but also gain the advantage of improved vigor to transplanting. The bottom line: cultivate native mycorrhizaes through the good gardening practices you already know and that are listed below. When dealing with very poor soils, or seedlings in a greenhouse, it can be helpful to purchase and supplement non-native mycorrhizal spores from the sources listed in this article, or other reputable, recommended suppliers of mycological and/or plant health inoculants. How do I cultivate mycorrhizae? The good news for many readers, is that you probably already know how to cultivate these important mycorrhizal fungi. Some of the primary, basic principles of “sustainable” or “organic” agriculture are also the primary practices required to cultivate a healthy, balanced population of native mycorrhizal species. 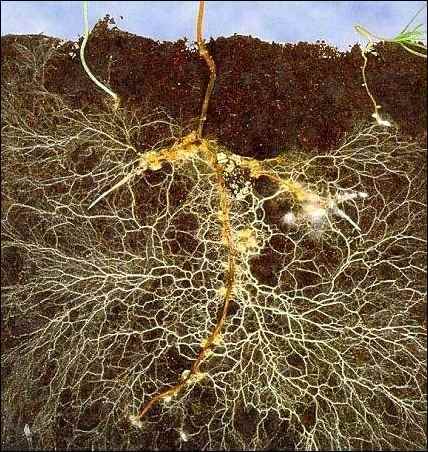 A complex as soils are, by focusing on some core management practices, your mycorrhizal population will flourish. Improving organic matter through the addition of compost. Elimination of synthetic pesticides and fertilizers. Rotation of crops within garden beds by season and year. Adding mycorrhizae to greenhouse seedlings or depleted soils is fairly easy. The preserved spore or mycelial material will come in one of several dried forms – usually a powder or tablet. Follow the directions for dilution and apply evenly and directly at the soil level to the targeted seedlings or plot. Myco-Gardening: A Gourmet Mushroom Bed in Your Own Backyard! Growing your own edible, gourmet mushrooms will become another joyous series of events dotting the summer growing season. As a beginning myco-gardener, you will purchase, rather than grow, the initial mushroom mycelium, or substrate, which will be planted. The techniques below will guide you through the basic options, with some recommended resources for further exploration. Following the techniques is a brief overview of the major mushrooms appropriate to grow in your vegetable garden. When it comes to getting started with your myco-garden, you simply need to remember three out of the next five words: “Put IT IN the GROUND”. “IT” is a chunk of mycelium—or pre-grown mushroom roots, ready to be planted in the ground. “IN” means about 1-1.5 inches deep in the soil, where you’ll place and cover the mycelium. And “GROUND” refers to the soil surrounding one or more of the recommended garden species you are probably already growing. Below, are a few variations and suggestions made to this basic outline. Here, I include some brief first-hand accounts, where possible, to share the details of how I have approached a situation. “Mycelium Running: How Mushrooms Can Help Save the World”, by Paul Stamets, is the definitive guide to myco-gardening techniques. However, I have found it is most important for you to get hands-on with the concepts, get some experience, and “put it in the ground” . I started growing mushrooms the way most people do today: through a mail-order kit from Fungi Perfecti. I had been growing shiitake and reishi using just the plastic-bag kit the mushroom company had supplied, as I had done off-and-on for years. My reishi mushrooms were flourishing but my woodchip block of shiitake had become contaminated with a bluish-green mold. I sliced off the half of the block that was contaminated and, being late may in coastal Maine, I buried the contaminated block of fungus roots near the herb garden in our back yard. To my surprise, perhaps about three weeks later and following a rainstorm, a small family of perfectly formed shiitakes emerged right from where I had put it in the ground. I picked the first handful, and 2 days later the second flush was ready. But a stir-fry and omelette later, the patch went dry and nothing more was ever seen. Since then, I have repeatedly seen mushroom mycelium that is contaminated from indoor cultivation, become healthy and invigorated by being buried in the shade of garden vegetables. This is the simplest way to begin to understand the methods of myco-gardening. 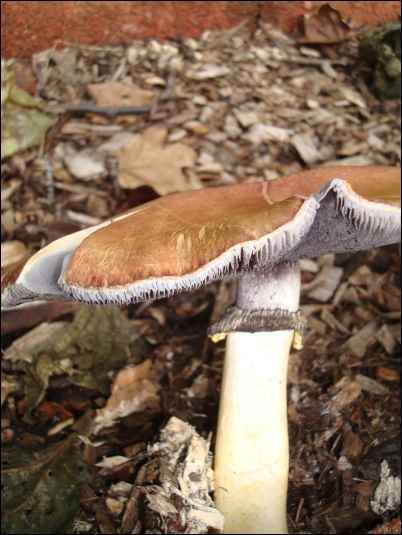 Purchase one or more “production blocks” of mushroom mycelium from the suppliers listed. Cut off a good sized chunk and put it in the ground. If you have access to wood chips and sawdust from non-aromatic hardwoods, you can really start producing some fabulous field mushrooms. By breaking your mycelium into small chunks and “sandwiching” those pieces between two layers of wood chips, you can create an entire bed of production for several species of edibles. If you begin using wood chips, I recommend reading one or more of Paul Stamet’s books, as he highlights several helpful points to consider. In 2008/09 I worked with a group of 7th and 8th grade students in coastal Maine to grow elm oyster mushrooms along side their kale crop for their school cafeteria garden, as part of their Farm-to-School Program. In April 2008, the 7th grade science class used basic kitchen equipment to pasteurize chopped straw from the local feed store. This cooled, wet straw was placed into medium sized plastic bags with air-holes and allowed to ferment indoors for 3-4 weeks. By May, the bags of colonized mycelium were brought outside and planted in holes and trenches along side the kale seedlings. Volunteers watered and tended the garden as usual over the summer. During an early October garden harvest for the school lunch program, 8th grade students studying world hunger discovered a full bloom of elm oyster mushrooms in the cool misty shade of the now overgrown kale patch. Enough to create a specialty stir-fried side dish for the hot lunch program, and teach students about alternative sources of protein. The straw method is simple and appears productive. Several informative videos are available on YouTube. Although these resources all direct you to fruit the mushrooms in a greenhouse of specialized grow room, we have had luck by directly burying the colonized straw alongside brassica beds. 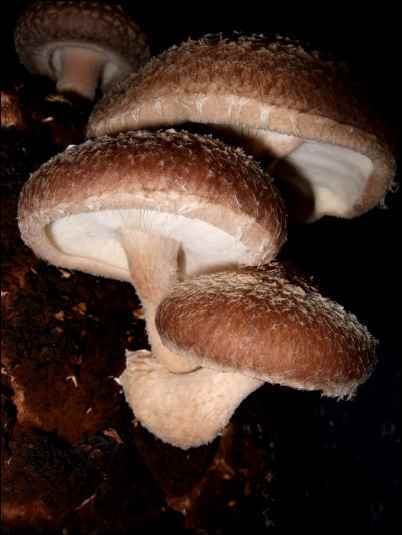 Some species, specifically Shiitake and Reishi mushrooms, particularly prefer to grow off of logs. These can still benefit from being placed in food and pesticide-free landscaping beds due to the moisture and shade provided by the plant life. 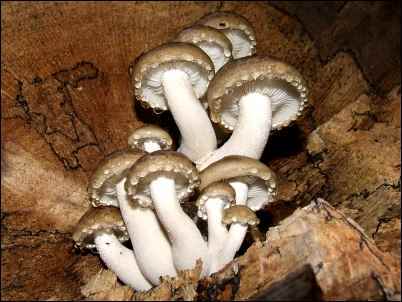 Several mushroom mycelium producers advocate cultivating buried logs of shiitake and/or reishi. Both Fungi Perfecti and Mushroom Harvest, listed below, offer all of the supplies and simple tools required to inoculate hardwood logs such as oak, poplar, beech, birch, willow, and other non-aromatic hardwoods. What is required is the block of mushroom mycelium, a drill, and preferably a hand-inonculator available from listed mushroom supply companies. Second only to the everyday “Agaricus” varieties of button mushroom, the delicate and mild oyster mushroom (Pleurotus ostreatus) ranks top among production for mushrooms considered “gourmet”. Yet the elm oyster mushroom (Hypsizgus ulmanarius), while similar in appearance to it’s commonplace namesake, is a completely different species. Elm oysters have a nutty flavor and more firm texture, but their culinary benefits are just a starting point. This species also has reported beneficial symbiotic relationships with certain vegetable crops – especially brassica species, and grows exceedingly well among kale and broccoli plants. Paul Stamets has reported a 2-fold increase in brassica yields and a 3-fold total food production increase when the vegetables were grown in the same bed as elm oyster mushrooms. Both Fungi Perfecti, and Mushroom Harvest carry elm oyster strains, but be sure that you don’t confuse this with the common pleurotus species of oyster – of which there are many varieties as well. The pleurotus species of oyster mushroom actually appears to have negative impacts on some vegetable species and should not at this time be grown in the garden. A traditional symbiont of the grain fields for many european peasant farmers, the giant “wine cap” mushroom – so called for it’s burgundy aroma at maturity—can be a choice edible at best, or pig food compost at worst. Thought to be share a mutually beneficial relationship with corn, wine caps can become a perennial crop in your garden rotation for many growing regions in the US. A classic for both superb taste, and well-documented medicinal value. Shiitakes have a long history in Chinese medicine and are a delicious addition to many dishes. Shiitakes will dry well, and store for a a very long time. Shiitake genetics vary widely. The small, pale varieties mostly sold in super markets pale in comparison o the meaty beasts that Fungi Perfecti and Mushroom Harvest are able to offer. 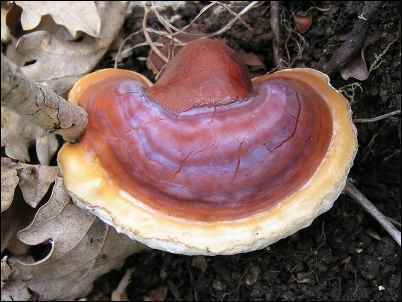 If you drink tea, you should be growing reishi mushroom in your garden. This venerable and ancient medicinal tea-mushroom provides innumerable health benefits from consuming it, and incalculable joy in producing it. It’s almost alien-like, smooth, lacquered fruit body emerges from wooden substrates, responding to even minute change in the environment. Before long, the durable, spiraling, bright-red conk is available for harvest. Substrate buried in the spring can produce enough conks for your winter’s tea supply! Just like gardening with plants, myco-gardens are extremely seasonal. Also just like the plant world, mushrooms have those species born to store, storable with some help, and even those difficult to impossible to put away for much time. Reishi mushrooms are hard, durable conks that can be difficult to even saw apart. They will store at room temperature for a long time, I even keep a couple whole conks out on a window sill for decoration. For all other mushrooms, low-temperature drying is the preferred preservation method. The simplest method for this is to simply place the mushrooms on clean trays in a sunny, protected area until fully dried. Shiitake mushrooms dried with their gills facing the sun will actually produce a significant amount of vitamin D. For the high-tech handyman, any of the solar-vegetable drier plans available will also dry most mushrooms. Oyster mushrooms can be dried but with significant loss of quality, and enoki mushrooms should not be dried at all. As you venture into the exciting world of home mushroom and mycorrhizae cultivation, remember to to experiment, reflect on what worked, what didn’t, and then experiment again. Things may seem unfamiliar at first, but if you start small and pay attention you’ll be sure to succeed in no time. www.SoilFoodWeb.com: An excellent resource on the practical management of fungi and other life forms in your agricultural ecosystem. Mycorrhizal Applications inc. has a number of interesting and/or helpful references on the subject, and a number of products as well. Paul Stamets website and e-store: Fungi Perfecti. Excellent books, and a wide range of mycorrhizal products, under the “Myco-Grow” label. Paul’s extensive in-vivo and in-vitro spore preservation work has led his company to hold absolutely surperb mushroom genetics. His shitakes are truly unlike anything you will see in stores or even most farmers markets. Paul is the original gourmet mushroom producer. He has changed the face of the industry and the ability for home gardeners to work with mushrooms and mycorhizae! www.MushroomHarvest.com: A wonderful company out of the mid-west. A small team of dedicated and professional mushroom producers with a complete line of mushroom cultivation supplies. You can buy a simple mushroom kit and put it in the ground, or you can buy everything you need to start from the mushroom spore it self! Mushroom Harvest has excellent prices and wonderful service.